Blind tasting is one of the most humbling yet crucial things a wine professional can do. It forces concentration and engages your senses more than conventional tasting. It illuminates the fact that when you cannot see the bottle, you are in essence walking around a room in the dark, feeling your way to get your bearings. All professional tasters have a system. Sight, smell and taste are the most obvious ways of analyzing, appreciating, discovering and even dismissing a wine. I know, dismissing sounds a tad harsh, perhaps pompous, but dismissing is truly not what a good wine judge wants to do. After all, every wine has traveled a long distance. 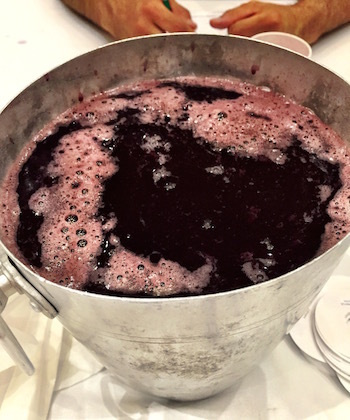 From flower to berry to maturity and harvest, the grape, which makes the wine, then undergoes alcoholic fermentation and possibly a number of other human decided interventions such as ageing, barrel time, lees stirring, secondary fermentation et cetera, before bottling. In many cases, it's just short of blood, sweat and tears. None of this should be dismissed. Unfortunately things go wrong, which is why a wine is passed over when being judged. Personal feelings can also come into play. That's why judging on a panel is imperative. 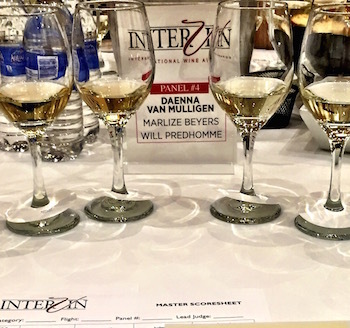 In mid-August I returned to Niagara, Ontario for the seventh annual InterVin International Wine Awards. 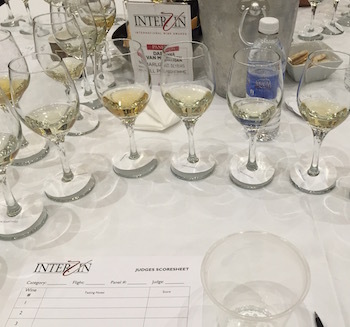 In conjunction with established Canadian wine magazine, Vines, InterVin has proven to be Canada's most significant international wine competition. Each year the number of entries grows. Considering this, for the 2015 competition, head judge Christopher Waters (founder and editor of Vines Magazine) increased the number of judges to form an additional panel. The significance is, each brings a different perspective to the table. The sommelier is on the front line with the consumer. They are especially interested in wine and food pairing and what wine lovers are seeking in his or her restaurant. The media judge is usually the one who tastes the most, the broadest and most diverse range of wines from around the world. They generally travel a lot and are conscious of new trends and are familiar with regional character. The winemaker is the one with the most technical experience - how the wine is made, the cause of faults and the most gracious of quality wines. Each is looking for balance, typicity of varietal and overall quality. 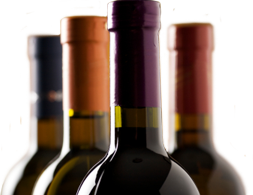 But we also look for great value, wines you want to drink everyday - affordable wines. I have judged in many types of competitions. Some, such as VinItaly, are much more constraining. Panels sit in rows (discussion is prohibited), sommeliers in full dress march like soldiers down each aisle, carafe firmly in hand and pouring each taste. Others are much more casual, they take only a few hours to complete and similarly don't place as much emphasis on discussion or diversity of panel personality or experience. That's what makes InterVin so special. Before the tasting ever takes place, the head judge categorizes each wine and decides, when it will be tasted and in which flight. A group of volunteers helps carry, sort and organize the wines in the days before the judges arrive. The wines are labeled by flights and corresponding wine tags are printed for each wine in each flight. Wine tags are paper discs (shown at right), which fit around the stem of the glass at the base. The volunteers are responsible for organizing wine flights on a trolley and bringing them out to each panel. The wines are all evaluated before release to the judges - in case of a corked or otherwise faulted wine. Each panel has their own table assigned. Bread, crackers, sparkling and still water are provided as well as spit cups and a central dump bucket. One person has been elected by the head judge to be panel head. The panel head is the one who tabulates the panel's results and needs to step in if a consensus cannot be reached. Each person is given a judging sheet to write their name, the panel number and the flight they are evaluating at that time. The sheet is divided up to allow each judge's tasting notes to be jotted down beside each number, which corresponds to the wine being tasted. Generally each flight is between 10 and 15 wines. Sometimes, in rare situations, the flights are larger or smaller. Each panel member tastes in a different order if possible. For example, from the middle outward or from right to left. If any of the judges feels a wine is not showing well or is obviously faulted, a new bottle is opened. Each panel tastes approximately eight flights per day - four in the morning and four in the afternoon. Each flight takes roughly 45 minutes. Initially the judges taste the wines silently. 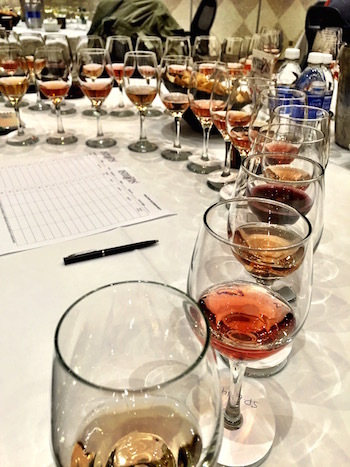 After spending time, sniffing, tasting and taking notes on each wine, each judge gives the wine a score on the right hand side of the judging sheet. A score of 12 means the wine is faulted. A score of 13 means no medal. Once individual judges have evaluated and scored each wine in that flight they discuss each one as a panel. Often there is solid consensus, the scores might range only within a few points. The panel's head judge marks the combined decision (medal, no medal, fault) on a master score sheet. Sometimes there are larger discrepancies in the judges scores. This is when conversation can become quite heated. It can also be very educational and eye-opening. The panel head has to encourage discussion. Why did one judge like this so much, another so little. Everyone gets a say and has a chance to try to get the other judges see their point, often in hopes of swaying them if they feel strongly (be it positive or negative). 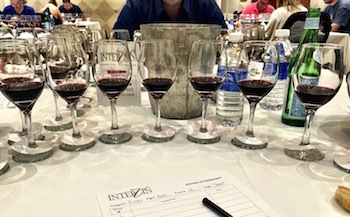 If there remains a difference of opinion the panel can put the wine forward to be re-tasted by the entire lineup of other judges on the last day of the competition. As each panel finishes a flight, the scores are tabulated in a computer. Scores will be awarded. Unanimous scores are basically a done deal. Others may be put forward to be re-tasted on the final day. The wines that have been put forward to be tasted on the final day will be tasted by all with no panel discussion afterward. The decision will be made when all 21 individual scores come in and those scores tabulated. The 2015 competition had a record number of entries at nearly 1400. That means 4200 bottles had to be organized (InterVin asks for three bottles for each entry. An initial wine to pour for the panel, a backup bottle if the first is faulted and a final bottle for those wines, which make it through to a re-taste on the final day) before the judges ever arrived. The results will be announced in October in a special issue of Vines Magazine as well as in the weekend edition of the National Post - a major sponsor of InterVin. I will post the results here as they are released.